Opinion: "Why do we fall?" By Shazia Saleem, Founder ‘Oh My Good Nosh’! Three days of watching Friends on repeat in my pyjamas. A week of trying to understand what had just happened. A fortnight of desperately searching for a new manufacturer. A month of flights back and forth to Ireland to set up a new manufacturer. Three months of falling into a black hole when the Irish manufacturer pulled out a few days before our relaunch. 10 days of solid soul searching and reflecting in Portugal. 14 months of exceptionally hard graft, zero social life and countless leaps of faith. One amazing mission to make a comeback. It was 6:30pm on Wednesday 21 October 2015 which is not a day I’ll be forgetting about any time soon – the ieat fairytale story we’d been writing for the previous 18 months took a dark turn. We had found out on BBC News that the factory we had used to make our chilled meals had, completely unbeknownst to us, gone into administration. We were just ‘collateral damage’ with all of the great things we had achieved, through no fault of our own, now gone. Things went from a hundred to zero almost overnight. The ieat management team left the business and we had to let go of all of our staff. What was already a lonely role, became even lonelier. A bunch of new brands came into the space we had left on shelf. There was one point where we had less than £10k in the bank account and I began to question whether the quest for a quality shepherd’s pie was really worth all this hassle. When I reflect back on things, I realise how game-changing the 10 days in Portugal were. It’s amazing what some blue sky and sunshine can do. I locked myself away in a villa, which a friend generously donated having seen my state, and I just sat and pondered. For the first two days I didn’t even pick up a pen or my laptop. I just sat and stared out the window and let my brain breathe. It needed it. By the fifth day I’d put together a whole new plan. The business steps to develop that plan will follow in another blog but I felt alive for the first time in ages. By day eight I had found Luca, a key cog in the new plan and who, despite only speaking to him just once over the phone, I knew would be a gem for the business. By day 10 I was so ready to get going I was even working on the plane on the way back to London. It has been the hardest 23 months of my life. But with the difficulties there have been immense blessings. When you purify your intentions, doors just seem to open everywhere. Luca Floris, an award winning chef at a flagship food business agreed to join us, a fab new British manufacturer came on board and we secured a free-range chicken supply chain (the first mainstream meal brand halal or non-halal to do so). More doors kept opening. Azam Jaafri, the founder of competitor brand ‘Foodery’ that had launched after ieat had come off shelf approached me with a proposal of the purest intentions. This then progressed quickly into us acquiring his brands and bringing him into the team with the vision that we will achieve more by working together than working against each other. A selfless move on his part and nothing but a pure blessing on ours. So here we are with a new brand … so happy to introduce you to ‘Oh My Good Nosh! … that will be launching in the big 3 over the next few weeks. 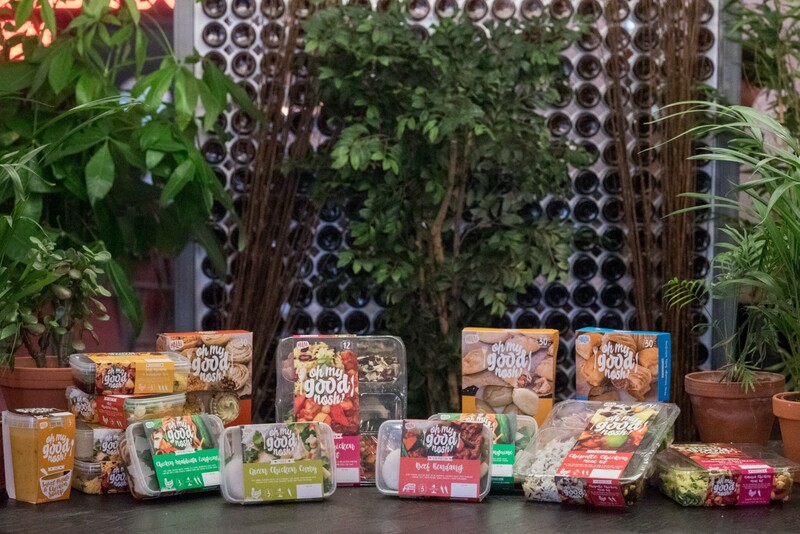 Starting with Sainsburys on 20th Sept, Asda 24th Sept and Tesco at the end of Oct. A range of 15 products including 6 fresh meals, 4 cook-at-home meal kits, 2 soups and 3 pastry lunch bite boxes. All made with HMC certified chicken that has been lovingly reared free-range without being given any antibiotics or hormones for artificial growth – completing a pledge I made to myself back in Portugal. In the range is also a delicious Syrian Chicken Kabsa, co-created with Chef Imad Alarnab, an excellent chef from Syria, who sadly lost his restaurants in the war before walking across most of Europe and being granted refugee status in the UK. 100% of the profits of this dish will go to a donation to Unicef’s emergency food parcels to children in Syria’s refugee camps, a plight very close to my heart. We’re also donating 100% of the profits for the whole of October’s sales across everything in the Ladbroke Grove branch of Sainsbury’s to the residents of Grenfell Tower. This is ?an atrocity on my doorstep that I feel compelled to do my bit towards. Please do share this post, get behind us and spread the word. We’ve overcome all sorts of hurdles, black holes and mountains to bring you the very best food that will have you saying ‘Oh My Good Nosh!’ with every meal. ‘Why do we fall?” you ask? Well the most simple answer i can think of is no-one has anyones best interests at the heart of what they do, everyone is in it to make a quick buck! Take “Oh My Good Nosh” for example, theres a lot of hype about the food and how its good in this and good in that and that its of top quality. I emailed this company on hello@ohmygoodnosh.com on 29/11/2017 highlighting concerns regarding the lack of quality with their products to which i have still not received a response. I followed this up with another email on 14/12/2017 and again no response! Epic customer service eh?! Oh my good god!